Spice today launched its 5.5 Inch Display phablet, Spice Mi-550 Pinnacle Stylus, which comes with a quad core processor and a stylus. This phone is priced at Rs. 15,499 and will appeal to those users who desire that extra display real state. Let’s take a detailed look at the specs of this phone to understand where it stands with respect to the competition like Micromax Canvas Doodle 2 (Full Review). The Primary camera of this smartphone comes with an 8 MP sensor and is capable of Full HD 1080 p video recording at 30fps. A dual LED flash is also available for low light photography. Spice has not yet specified if the sensor is a BSI sensor. Considering the MP count the camera is better than rival phones like Lenovo A850 but less efficient than 12 MP camera of Micromax Doodle 2 (Quick Review). A 2MP front camera is also present for video calling. The internal storage memory is 8 GB which is pretty good at this price range. Moreover the memory is further extendable to 32 GB unlike Micromax Canvas Doodle 2 which has 16 GB internal storage but does not support MicroSD card. This phone will be powered by MediaTek MT6589 Quad core processor which ticks at 1.2 GHz. This is now a very common processor in this price range and is assisted by PowerVR SGX544 MP GPU. The RAM capacity assisting this processor is 1 GB which will provide for smooth multitasking in general day to day usage. The processing power can be considered slightly less than that of phablets like Lenovo A850 in the same price range. The battery capacity is 2500 mAh which is above average and apt considering the screen size. Although Spice hasn’t mentioned the talk time you will get but it is expected to be around 8 hrs. This phone comes with a 5.5 Inch TFT LCD display with 1280 x 720 p resolution. This gives you pixel density of 267 ppi which is better than what phones like Lenovo A850 and Micromax Doodle 2 will offer. The display will be similar to phones like Karbonn Titanium S9. 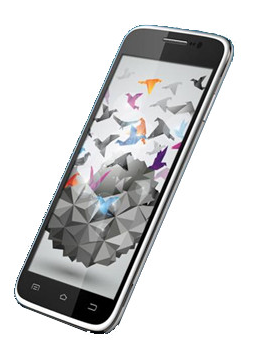 The phone runs on Android 4.2 Jelly bean operating system and comes with gesture screen lock feature. This phone supports Dual SIM Dual Standby functionality with both SIM cards supporting 3G connectivity. The phone is also expected to come with a stylus which will rest in a body cavity. The phablet comes with gesture features like Intelligent Answer and Flip to mute. you will also get a 1 year subscription of Evernote premium App and Skitch, which helps you draw on your screen with your stylus. The phone is quite sleek with body dimensions of 158 x 79 x 9.5 mm. This phone will be available only in black color as of now. All navigation buttons on the front panel are capacitive buttons and only hard keys on the phone are power button and the volume rocker. The phone sports candy bar body design which most probably has a slot for stylus too. Connectivity features include 3G, GPRS, EDGE, WiFi, Bluetooth 4.0, USB and GPS with A-GPS support. This phone will compete against phones like Micromax Doodle 2, Samsung Galaxy Mega 5.8, Karbonn titanium S9 and Lenovo A850. The biggest edge this phone has over its rivals is that it is cheaper and sports a fine clarity display. At this price range this phone will definitely give you good value for money and can be considered by those who love big phones and who like to read on their phones. This phone houses enough processing power to smoothly carry out all day to day operations, although you might experience some lag while extensive gaming. The phone is available for purchase from Saholic at Rs. 15,499 and you will also get a flip cover inside the box. would you suggest Spice MI 550 stylus or Micromax doodle 2? or should i go for a high end product (with 2GB RAM, 16 GB Internal Memory etc) and procuring the stylus device and downloading stylus Notes application ?